At Santa Fe’s new spa resort, freshness and wellness are built into the menu. Above: Paul Novak&apos;s vegetarian tortilla soup packs a Chimayó red chile kick. CHEF PAUL NOVAK started cooking in Santa Fe restaurants during high school, but took off soon thereafter, as lots of local kids do, to see more of the world. His culinary tour of the West took him to San Francisco, where he worked at Wolfgang Puck’s Postrio for three years and picked up what he calls his “main education in a real restaurant—professional, high-end fine dining in a really competitive environment.” This was followed by stints in Denver; the Seattle area; Pasa Robles, California; and even the cheese department of a Whole Foods in Los Angeles. But there came a time that he wanted to return to New Mexico, to see what it was like from an adult perspective. In the early part of this decade, Novak was chef de cuisine at Geronimo, the Canyon Road bastion of fine dining that he describes as “a super-busy, money-making machine.” From there he downshifted straight into the Ojo Caliente Mineral Springs Resort and Spa—“an oasis in the middle of nowhere with a farm on it.” And even though he never used to like cooking for vegetarians, he’s now serving up a very “vegetable-forward” menu at the Blue Heron Restaurant at Sunrise Springs, Ojo’s new sister resort on a historic 70-acre property in the village of La Cienega, at the southwestern fringe of Santa Fe. As the executive chef, Novak is tailoring the Blue Heron’s menus to fit the bucolic spa resort’s wrap-around wellness ethos. Keywords for the cuisine include “freshness, awareness, moderation.” The following recipes for a five-course menu for four reflect those values, with an emphasis on what’s in season in northern New Mexico in early summer, and a commitment to simplicity. 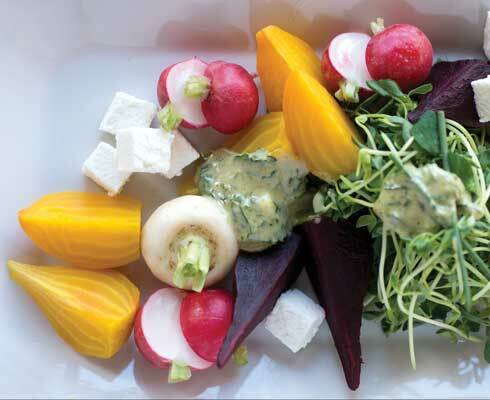 Like these beets and radishes, much of the produce used at Sunrise Springs is grown at Ojo Caliente. 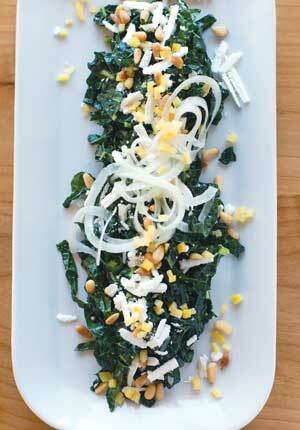 Piñon nuts lend local flavor to the Tuscan Kale salad; preserved lemon could become your new go-to secret ingredient. An hour before dinner, massage kale with 3⁄4 cup dressing, more as needed to taste. Set aside and toss every 20 minutes. Place pine nuts in pan and toast on low heat. To serve, place a mound of kale on plate, drape onions over kale, and sprinkle pine nuts, ricotta salata, and preserved lemon on top. Wash lemons in cold water, then slice 3⁄4 of the way through lengthwise. Place lemons in jar, add salt and lemon juice and mix well. Write the date on the lid and close the jar lightly, leaving just enough space to let out air. Place on counter at room temperature and shake 3 times a week. Test lemons in 40–60 days; when ready they should be soft, as if cooked. When preserved, move to refrigerator, where they last for 6 months. To use, discard the pulp and dice the skin finely for use. The lemon can also be used on chicken and fish. Turn oven to 450° F. Cut off tops of garlic bulbs and rub with olive oil. Place in small baking dish and roast 20–30 minutes until soft and golden brown. When cool, squeeze the bulbs to release the roasted cloves. Heat a gallon-sized soup pot with 1⁄2 cup of olive oil. Add the diced onion and sauté for 5 minutes until soft with no color. Add oregano, cumin, red chile, and tortilla strips; cook for 3 minutes. Add the tomato puree and water, lower heat to medium, and simmer for 20 minutes until tortillas start to fall apart. Add the cilantro and roasted garlic cloves. Cool to room temperature and puree in batches in blender until smooth. Taste and add salt as needed. 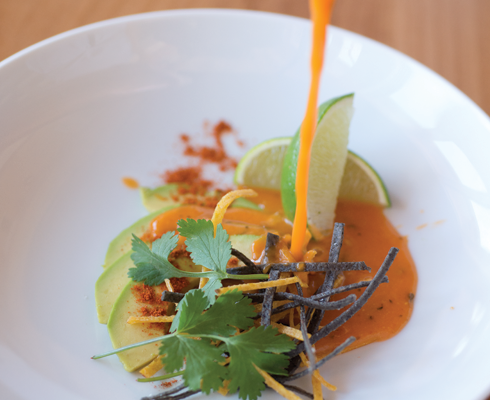 To serve, reheat and garnish with chopped cilantro, sliced avocado, and a wedge of lime. 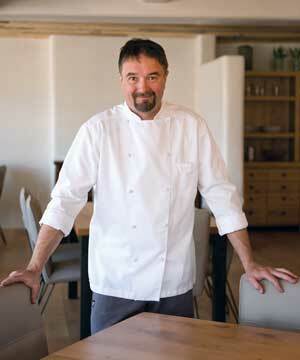 Meat is used judiciously at Sunrise Springs by chef Paul Novak. Heat oven to 450° F. Dice the potatoes in 1⁄2-inch cubes and toss them in olive oil and salt. Place in a large cast-iron pan and roast for 25–30 minutes, turning every 5 minutes. Remove from oven and lower heat to 350° F. While potatoes roast, make the savory herbed garlic pesto. Place garlic, herbs,and half the oil in blender. While blending, add remaining oil a little bit at a time to reach a sauce-like consistency. Pan-sear lamb on high heat for 3 minutes on each side and place in oven at 350° F for 8–10 minutes (medium rare), along with the potatoes, to reheat. Meanwhile, steam snap peas until just tender, pour out water, and return peas to the pot with a little butter, salt, and pepper. 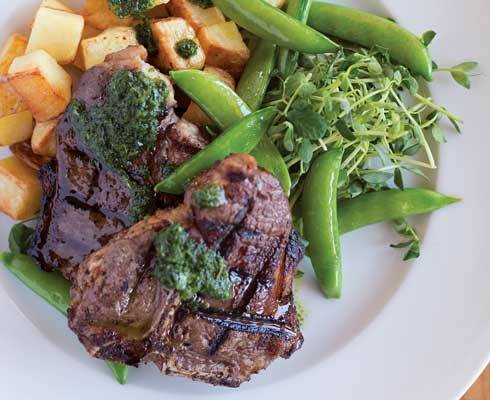 To assemble, place roasted potatoes on plate, mound the lamb atop, arrange snap peas over the meat, drizzle with herb sauce, and garnish with pea shoots. 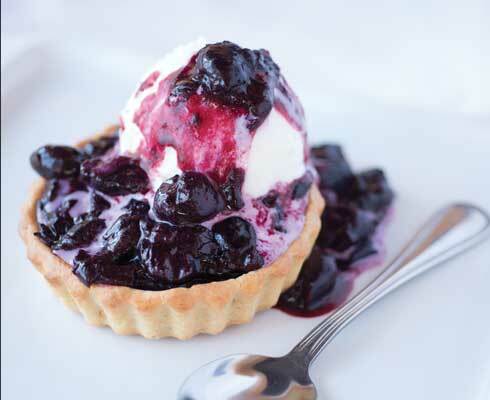 Novak&apos;s bing cherry tart looks good enough to eat. Mix all ingredients together (with a pinch of sea salt) intil dough is thick and pliable . Oil individual 4-inch tart pans, then press dough into pans to about 1/8 inch thick. Bake shells at 350° F for 15–20 minutes until just baked but still white. In a small cup, mix cornstarch and lemon juice with a fork (add a little water if it’s sludgy). In a medium saucepan, cook cherries on low heat until they give up much of their moisture, about 20–30 minutes (shorter for frozen, longer for fresh). Taste cherries and add sugar to taste. Bring filling to boil on high heat. Re-stir cornstarch mix, then pull filling off heat and add cornstarch, mixing thoroughly and quickly. Return filling to medium heat, stirring as the filling becomes thicker and clearer. In a saucepan, combine coconut milk, coconut cream, agave, and sugar. Cut vanilla bean in half and then cut open lengthwise, scraping beans into the milk mixture. Cook on medium heat until it begins to simmer. Add salt, pour into a blender, and mix on high for 1 minute. Refrigerate for 5 hours, then churn according to your ice cream maker’s instructions. To assemble, warm tarts in hot oven for 8 minutes, then top with a scoop of ice cream, pouring a bit of reserved cherry filling over it.